The Colorado Rockies (32-40) are coming off a 6-4 win over Arizona, led by Troy Tulowitzki who notched the first pinch-hit home run of his career. 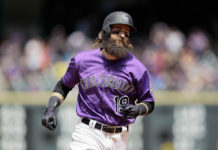 That prompted a five-run eighth inning the Rockies much needed to earn the series victory heading into a 10-game road trip beginning in the Bay Area. Friday night, Colorado will play the NL West’s current second-best, the San Francisco Giants (40-34), in a three-game series. Once the Rockies take care of business at AT&T Park, they’ll travel across the Golden Gate Bridge for another three game set against the A’s. They’ll finish the road trip with a four-game set at Arizona over the Fourth of July weekend. San Francisco is fresh off a 13-8 win against the Padres, steered by Brandon Belt who hit two of the Giants’ four triples in the game, marking that the first time they’ve notched so many three-baggers in one game since 1960. 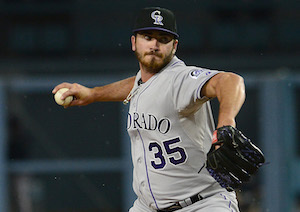 Starting on the mound for the Rockies Friday is Chad Bettis, who is 3-2 with a 3.44 earned run average through eight starts this year. 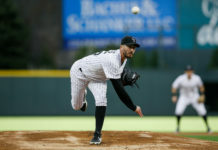 Bettis, a 26-year-old righty, beat San Francisco on May 24 behind a season-high 8.1 innings, scattering two runs and six hits while fanning seven. With the Giants offensive power, Bettis has a tough matchup ahead in this series opener. Opposite of Bettis on the hill is Tim Hudson, who gets the start for San Francisco and is currently 5-6 with 4.52 ERA this season. Rockies Michael McKenry leads the team against Hudson hitting .455 and pinch hitter Rafeal Ynoa isn’t far behind at .400. Outfielder Carlos Gonzalez will likely play in the Giants series including the opener after not starting in any of the Diamondbacks series due to a left hand injury. Also reliever Rafeal Betancourt is expected in the outfield with CarGo at some point in the series after being placed on the disabled list June 7 when he showed symptoms of vertigo. Although it has been a tumultuous season thus far for the Rockies, they have shown bright spots where they can compete with the leagues’ best. Colorado swept a three-game set in San Francisco including the Giants home opener from April 13-15 and lead the season series 6-3. In the last matchup against the Giants in Denver on May 24, there was a seven-hour rain delay but there are clear skies expected all weekend in San Francisco. Currently last place in the NL West, the Rockies look to have a successful 10 games in 10 days stint away from home to stay afloat in such a competitive division.